Every life holds a higher purpose. It is important to know how our actions and thoughts contribute to this purpose and, therefore, to the good of others. When we connect our will to a higher will we immediately do well and serve others. When we serve others there is a richness of spirit in our lives. We all have a special contribution to make. When we dream about our ideal life, we are beginning to envision our highest potential. And, if we can align our lives with the highest good for all, we experience the benefit of this in our own lives. Inner listening is a sure way to connect with higher will. Notice messages that come through in your dreams as well as the signs that make themselves clear in your day-to-day life. The energy that we have in our day is directly correlated with our higher purpose. When our actions and higher purpose are aligned we experience a vibrancy and energy that feels alive. If we experience our energy shutting down or dullness, we are probably not aligned with our higher will. Listen closely for the messages through moods, signs in the body, the quality of your health and the way that you feel in certain environments. Your body your mind and your spirit all hold extremely valuable information. As we move towards the mid-year point, notice if you are living awake or asleep. Join us in the Essential Feminine Living Room for a complimentary adventure that is sure to awaken your spirit and connect you with amazing women from around the world. Register at the links below. Knowing what we value deeply-what we hold most dear, when in alignment with being of service to the greater will of all allows us to take right action in our personal and professional lives when the will and action are conscious and in alignment, integrity follows. One of the greatest challenges is to be clear on what is most important to us and have the courage to act in a manner that is right. Some examples to look at are the whistleblowers that have uncovered deceptive actions that have caused great pain in the lives of many. There is a voice within us that tells us when we are acting right and when we are not. Small children are taught this from a very small age in huts in Africa and India and mansions in the Riviera. One of the things that is most important is to take a regular inventory of how we feel about the decisions that we are making in our life day-to-day. Trust that inner voice; it carries the wisdom of the ages. 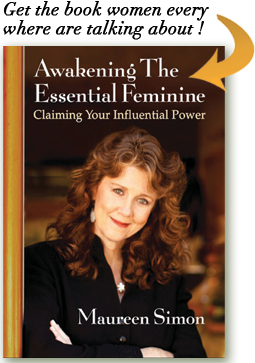 For more information on this topic join me for the upcoming webinar Creating, Influence, Success, and Power from the Feminine e-mail me at Maureen@maureensimon.com.